Jasper Copping. The Telegraph. 2 November 2012. The analysis is contained in a new book, All the Countries We've Ever Invaded: And the Few We Never Got Round To. Stuart Laycock, the author, has worked his way around the globe, through each country alphabetically, researching its history to establish whether, at any point, they have experienced an incursion by Britain. "Do you know why the sun never set on the British Empire?" "Because God could not trust the British in the dark." "How To Lose a War: A Primer"
Mark Safranski. Zenpundit.com. 28 July 2013. This is one of the best posts I have read this year. I cannot recommend it enough. Bill Gates interview with Vaclav Smil. Gates Notes. July 2013. He understands a phenomenal range of subjects, from energy to agriculture. On any page he might talk about meat-eating among bonobos or the average human life span during the Roman Empire. Plus he is rigorously numeric, using data to illuminate every topic he writes about. The word "polymath" was invented to describe people like him. One cannot read a book by Mr. Smil without being both delighted and intimidated with his staggering level of knowledge in both the physical and human sciences. Perhaps more importantly, Smil never stoops to polemics. Dispassionate, data-driven, and empirical to a fault, Mr. Smil is my preferred guide to every subject he writes on. "Understanding the EU Regime: 5 Charts"
Crag J. Willy. craigwilly.info. 28 July 2013. Craig J. Willy explains how the EU really works. Substantive essay organized around 5 charts. "Modern Economics is 'Built on the World's Dumbest Idea'", "The 'World's Dumbest Idea Killed the U.S. Economic Recovery" and "FT Urges Business Schools to Stop 'Teaching the World's Dumbest Idea'"
Steve Denning. Forbes. 9, 22, and 29 July 2013. Steve Denning has declared war against 'the world's dumbest idea', maximizing shareholder value. Denning understands something most observers do not recognize: this idea has transformed the political economy of the United States of America. Every single meta trend from the 1970s to now can be traced back, in one way or another, to corporate America's adoption of 'maximizing share holder value' as its raison d'etre. "Maximizing Shareholder Value: The Goal that Changed Corporate America"
Jia Lynn Yang. The Washington Post. 26 August 2013. Karen Ho devotes around 100 pages or so to this topic in Liquidated: An Ethnography of Wall Street. Adam Elkus. Abu Muqawama. 2 August 2013. Lynn C. Rees. Zenpundit.com. 10 August 2013. "Kill the Department of Defense"
Lynn C Rees. Zenpundit.com. 12 August 2013. Real politick inside the Department of Defense. Humorous and essential reading. Newest issue of Infinity Journal. Requires free registration to read. We can put this story in terms of the dynamics of complex systems. The great civilizations spawned in the early part of the 1st millennium—Latin and Greek Christendom, the Islamic Caliphate, Hindu India, and Confucian China—proved remarkably resilient over the following centuries. Despite wars and conquests, epidemics and famines, dynastic struggles and heterodox religious movements, they remained basically true to their founding visions. Even in Europe, the ideal of the Holy Roman Empire did not die until 1806, some fifteen hundred years after Constantine created a Christian Imperial Rome. These civilizations thus had the property of stable equilibria—even when greatly disturbed, they had self-restoring features, such as an elite committed to a core culture, key sacred defining texts that maintained their role at the center of that culture, and principles of rule including hereditary leadership, elite privileges and religious support for both. In order for a truly modern science to emerge, it would be necessary to break out of that equilibrium, overturning the authority of the sacred texts and the power of the monarchies and aristocracies to ban or punish skeptical and heretical ideas. This proved very difficult to do. Even when presented with evidence of new realities, new instruments, and new ideas, the traditional systems of Catholic authority in southern Europe, Caliphal and kadi authority in Islam, brahmin authority in India, and mandarin authority in China remained entrenched and prevailed. The entire issue is worth perusing. "A Southeast Asia Reading List"
Al West. West's Meditations. 10 August 2013. Al West compiles an annotated(!) list of the best 30~ books of pre-modern Southeast Asian history and pre-history. Fantastic. Andrew Currey. Nature 21 July 2013. "New Dawn For China? Corruption crackdown nets big and small officials"
South China Morning Post. 15 August 2013. A complete list of all CCP officials who have been sacked, suspended, or formally investigated for corruption since Xi Jinping announced the corruption crackdown in November 2012. Comes with an interactive map. H/t to Blood and Treasure for this one. "The Process Of Video Verification - Rabaa, Egypt, August 14th 2013"
Brown Moses. Brown Moses Blog. 15 August 2013. Using a 15 second clip of Egyptian protestors as a case study, Brown Moses shows how to use Google Earth to pin-point a Youtube video's exact location. Doree Armstrong and Michelle Ma. University of Washington News Release. 27 August 2013. Why does the Chinese public support the Communist Party of China? Many assert that the Chinese government retains its legitimacy through high growth rates. Few stop to consider what evidence supports the contention. Truth be told, there is not much. Westerners often speculate on the future of the Chinese Communist Party and the People's Republic it maintains. To use Taleb's phrase, when outside observers try to explain why the CPC has maintained power and popular support, their opinions cluster "around [one] framework of analysis." Their error? Equating the legitimacy of the CPC with China's breakneck economic growth. This idea is ubiquitous and unquestioned. I often wonder if those who reflexively repeat it ever stop and ask why they do so. Be it in defense of China's prospects or to its detriment, the notion that the CPC's legitimacy is tethered to the economic success of individual Chinese men or women is an idea assumed more often than it is proved. I invite you to think about this idea more critically. Source: John Michael Wright. Thomas Hobbes. National Portrait Gallery, London. Link. When Westerners are asked to explain why peoples support their governments, they often harken back to the Enlightenment Age theories of Thomas Hobbes and John Locke. I still remember the essay I had to write contrasting the two thinker's ideas for an 11th grade history class. I am not the only one to have these two men drilled into my head; near every book on state formation or "state-society" relations will drag out Hobbes or Locke and their competing philosophies of the social contract. Their approaches are usually held up as a sharp contrast to the other. Less noticed is what unifies both thinker’s ideas. 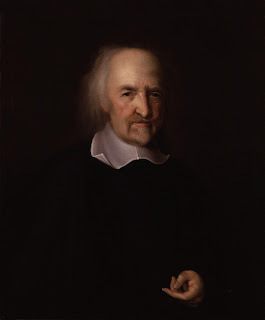 For both Hobbes and Locke the central actor was the individual. In the Hobbesian world individuals fled from the violence and brutishness of anarchy to the iron embrace of the Leviathan because each person needed the protection and security it provided. In the Lockean realm individuals joined together to create a social contract because they recognized that together they could protect their rights and further their interests in a way they could never do alone. In both worlds the decision to accept government authority was an individual one. Leviathan grew as each individual calculated it was in his or her best interest to trade some personal rights for the benefits that government might bring. Source: Godfrey Kneller. 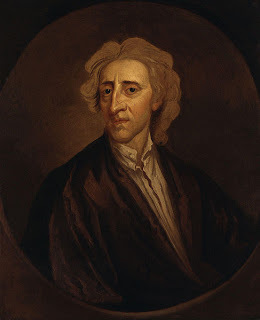 John Locke. Chinese thinkers have never espoused this type of thinking. The traditional Chinese social contract was not a compact between individuals and the state, but a compact between Chinese society as a whole and the state. Consider the famous ’mandate of heaven’ (天命) that justified imperial rule and policies from the usurpation of Wang Mang in the first century to the final death throes of the Qing dynasty in the 20th. Heaven itself was the key decision maker. It was through the consent of the entire Chinese body politic (especially the rebellion prone peasant class) Heaven's will was recognized and through an international system that placed the Middle Kingdom at the top of a multinational pecking order Heaven's favor was expressed. The roots of this concept extend back very far - the idea that ’the people’ or ’all under heaven’ will flock to, choose, or give way to the enlightened, disinterested, benevolent, or wise ruler has been espoused by philosophers from every major school of Chinese thought. Part of the appeal of Maoism is how readily it fit the mold of these patterns of thought: for Mao, it was the people - sometimes clarified to mean the peasantry - whose agency mattered, filling the same role that "Heaven" had in ages past. Self interested calculations of rational individuals coolly weighing their economic and political interests never really seemed to be part of the program. That was then. This is now. What kind of social contract do 21st century Chinese believe in? TG: "Do you like Xi Jinping?" Elderly Chinese Man (pretty sure he said he was from Jiangxi): "I like him much better than Hu Jintao. Hu Jintao was from Tsinghua University. I think people from Tsinghua feel they are very clever - but I do not believe they understand real life." TG: "Well what do you like about Xi Jinping then?" Elderly Chinese man: "I do not like all of the speeches he gives. I feel like his words are pretty, but we do not know if he will follow through will real actions. I think that many of his reforms will last for just a few years, then things will return as they have always been." TG: "But you said you liked Xi Jinping?" Elderly Chinese man: "Yes, I like him. I like him because he is hard on Japan. I know I can trust him when it comes to dealing with other countries. I could not trust Hu Jintao with Japan." TG: "So earlier you told me you felt Xi jinping was very clever. I keep hearing him say 'Chinese Dream'. Do you like this?" Chinese Grad Student (studying geology, grew up in Henan): "I like it." TG: "What does it mean? When you hear "Chinese Dream" what do you think?" Chinese Grad Student: "It means that China will become a better and better place. It will be a better place for my children than it was for my parents. In China there will be better health care, better education, and the living standard will increase In the future Chinese people will not have to worry about bowing their heads [in shame] to foreigners again." This is easy to forget when Chinese leaders trumpet phrases like “Chinese Dream” about. This is a great example of the confusion that can arise when Westerners use their own concepts to make sense of Chinese ideas - in this case mistakenly using the "American Dream" as a reference point to understand the Chinese term. Part of the confusion is purely linguistic. 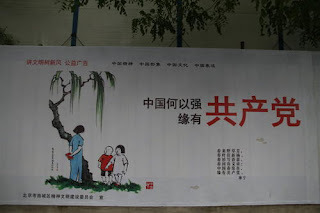 The Chinese phrase "中 国梦” can just as easily be translated as "China Dream" as "Chinese Dream." (When the term first appeared, Xinhua English did not know which translation to use and went with both.) But the way it is being used by Chinese leaders and Chinese laymen is very different from the way U.S. citizens approach their own "American Dream." A new poster board ad in Beijing reads "China's strength was caused by the CCP"
Source: "China Dream, a New Ad Campaign." Caijing English. 7 August 2013. Percentage of 'non-propoganda' Weibo posts that associated China Dream with personal, political, and societal aspirations. Source: Chris Marquis and Zoe Yang. "Chinese Dream, American Dream." Danwei. 28 June 2013. Rhetorical phrases like "China Dream" (and the policies they justify) are not novel innovations on the part of China's new leadership. They are just the most recent expressions of a script the Party has stuck to since the days of Deng Xiaoping. Economic growth is a part of this narrative, but it is not the narrative. Those who claim otherwise have mixed up means with ends. It is not hard to find examples that defy this confused explanation. Consider the 2008 Olympic Games. In preparation for the games Chinese authorizes displaced thousands of Chinese from their homes, shut down thousands of factories and coal mines near the city, made it illegal for Beijing drivers to use their cars two days in a row, and built a plethora of stadiums and public works that are now struggling to remain solvent. This is hardly the formula for economic success. It was never meant to be. China's leadership had different priorities. We ignore these priorities at our own peril. I have already written at length about how the narrative used (and probably believed by) the members of the CPC to justify their position at the head of Chinese society shapes China's actions on the international scene. I encourage you to read it. But there is no need to restrict this analysis to international affairs. The narrative of national rejuvenation can also help us make sense of the Party's domestic policies. The first wonderful thing it allows us to do is throw away the canard that the Chinese leadership's legitimacy rests entirely on the high growth rates. This idea makes intuitive sense. But - and this is a big but - I have never seen anyone present evidence that this assertion is true. Nobody ever seems interested in testing this idea against the data. If you have seen an opinion poll or public survey that suggests most Chinese support the CPC because of China's economic growth please share it with us. Until then we should recognize this idea as it is: a part of the received wisdom that is uncritically repeated because so many others seem to think it sounds right. I see no evidence that the leaders of the CPC think that it sounds right. Indeed, when the People's Bank of China began its "prudent monetary policy" earlier this year it should have been obvious that the Chinese leadership does not fear slower economic growth. The government's legitimacy is damaged less by fears of recession than claims of corruption. Accusations of plutocracy are toxic to the narrative of national rejuvenation and betterment. The national leadership's claim to legitimacy rests on the trust the Chinese people have that the CPC is actually making things better for China. Self serving plutocrats skimming profits off the top have no place in a People's Republic. They are the modern incarnation of traditional China's most reviled villains: the eunuchs, concubines, and empresses who managed to hijack the court and bestow honors upon their lineage members at the expense of the Chinese state. It was a truism that when the court placed corrupt private interests above the realm's needs the Mandate of Heaven would soon to pass to other hands. This is not a play any high ranking official in the CPC desires to act out to completion. Their actions show it. Western outlets are free to report on black prisons, environmental degradation, and Tibetan separatism without any comment from Beijing. But when the New York Times reports that a popular (and populist) Premier's family has grown rich off his political connections, the government denounces the report as "blackening China's reputation" and censors the paper in its entirety. The Times came a little too close to popping the narrative. The narrative also helps us make sense of the frantic pace at which Xi Jinping's administration has tried to declare and enforce reforms to flush the party of corruption while encouraging the press to play up every example of ignominious local corruption it can find. These seemingly contradictory actions start to make sense when you consider the script they are wedded to. They set the national government up as the shining knight ready to slay all of the local corruption that stands in the way of China's national rejuvenation. I could go on. I don't really need to. Follow the headlines closely (reading the links Bill Bishop collects for the Sinocism Newsletter every day is a good place to start) and you will catch the pattern. The Chinese leadership have defined themselves as the leaders of China's national rejuvenation. Their legitimacy depends on their ability to play the part. Their actions at home and abroad reflect this. Which makes sense. Their survival depends on it. P.S. Please also see my comment over at Zenpundit on the Chengguan-Watermelon Vendor incident. I was going to rewrite it into a separate post but I fear I won't have the time for it now. The topic - and my comments on it - are relevant to this broader discussion. For the record, he wanted 25元 and I ended up getting him down to 15元. A friend later told me that I had been ripped off, and could have gotten the same for 10元 if I had really wanted. The reader should be warned that these two statements cannot be considered representative of China as a whole. I remain woefully ignorant of the large peasant class' opinions (but then again so are 90% of people who opine on Chinese matters). I suppose never leaving Beijing also restricted my vision, but as it turned out most of the people I talked to at length were not Beijingers themselves. I did find Chinese who disliked the regime for more standard Western reasons (e.g. injurious to their personal liberties) but they were a rare breed. All were female, young, pursuing a college degree in Beijing, and absolutely obsessed with American television shows. Sometimes we underestimate the real power of American pop culture. 中国 means "China", or literally "Middle Kingdom." It is occasionally used the same way we might use the word "Chinese", but it usually refers to the Chinese state or things unique to the Chinese state. Over at Tea Leaf Nation Liang Pen takes this argument even further, arguing for a dynamic translation of the term as "National Chinese Dream." "President Presses Forward With Chinese Dream" Xinhua English. 11 March 2013. English translation provided by Chris Marquis and Zoe Yang. "Chinese Dream, American Dream." Danwei. 28 June 2013. Ibid. The only criticism I have of this analysis is that the authors discount the reblogs of propaganda posts as propaganda. Unless all of these reblogs were done by other state or media organs, we can assume that each reblog is an endorsement of the propagandist message by a Chinese citizen. They thus understate the number of 'political' interpretations of the dream by half. I is also worth remembering that Sina Weibo is not China, and there are real demographic discrepancies between those who use Weibo and those who do not. T. Greer. "Asian Great Power Politics: Spring 2013" The Scholar's Stage. 19 May 2013.